The internet and international community are abuzz over President Donald Trump's unprecedented consideration of whether to move the U.S. embassy in Israel to Jerusalem after nearly three quarters of a century. Whether this is a sincere policy statement or not, it is all the more remarkable considering that as recently as 2015, the U.S. Supreme Court recognized that the United States has never officially recognized Israeli sovereignty over any part of Jerusalem since 1948. In response, the Palestinian Authority ratcheted up its rhetoric and issued threats at the Trump administration's declaration; Philip Wilcox, former U.S. consul general to Jerusalem under President George H.W. Bush, said that U.S. policy "has always been that the status of Jerusalem should be resolved through negotiations, and any effort to move it unilaterally would be disruptive and dangerous for everyone." While declaring the move "disruptive and dangerous" is absurd, the problem is that the issue of Jerusalem ultimately has very little to do with the reasons originally given for the U.S. policy in the late 1940s, but has always been done solely out of the perceived foreign policy interests of the United States. To put it bluntly, the origins of this policy had nothing to do with Arab or Jewish interests, but lay in the desire to protect sites holy to Judaism, Christianity and Islam safe and accessible. The U.S. has never officially recognized Israeli sovereignty over any part of Jerusalem. In July of 1937, when Britain still administered the League of Nations' Mandate for Palestine, its Peel Commission stated that partition would revolve around "keeping the sanctity of Jerusalem and Bethlehem inviolate and of ensuring free and safe access to them for all the world." While Britain was attempting to retain some control over holy sites even as its Mandate was proving ungovernable, the priority was maintaining open access. 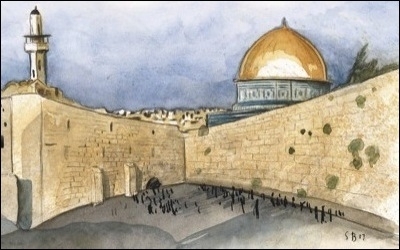 A decade later, when the unique Ralph Bunche drafted the UN plan to internationalize Jerusalem intended to protect sites holy to three major religions, the plan called not only for Jerusalem, but also its surrounding holy places and Bethlehem. The UN partition plan never went into effect, and Israel's territorial limits would essentially be determined by military achievement in its war of independence and post-war armistice negotiations, in which Bunch more than earned his 1950 Nobel Peace Prize. Interestingly, the Israeli leadership was negotiating with King Abdullah I of Jordan to resolve the Jerusalem issue even then. And even as the United States remained in favor of internationalization, Special Representative (later first U.S. Ambassador to Israel) James G. McDonald informed the parties that the United States would approve any arrangement between the parties, and candidly admitted that internationalization was effectively dead. Official U.S. policy since the early 1950s has been that Jerusalem's status should be decided by final peace negotiations. From the early 1950s onward, official U.S. policy remained effectively that Jerusalem's status would be part of final peace negotiations, one way or another, as University of Jerusalem Professor Shlomo Slonim wrote in his seminal book on this subject. Bethlehem, for all its own sanctity, would be virtually ignored, and to this day has remained out of the spotlight of international attention. Regardless of how one may view the Trump administration, his actions to date do not rely on fossilized State Department policy — including even considering relocating the U.S. embassy in Israel to Jerusalem. It is unfortunate that a stillborn plan originally hatched in the 1930s has contributed to the unnecessarily drawn-out Arab-Israeli conflict with Jerusalem squarely in the center. It is unfortunate that the same people who fear-monger about any change to Jerusalem's status in U.S. eyes ignore — or are ignorant of — the fact that Bethlehem and other holy places were always intended to be included in the political calculus of peace talks. Whether the new president will follow through on his promise, and how its diplomatic effects will manifest, can't be predicted at this point. But perhaps — just perhaps — there is an opportunity that hasn't existed since King Abdullah I was assassinated in 1951 for trying to make peace nearly 70 years ago. Relocating the U.S. embassy to Jerusalem would complete the recognition begun by President Harry Truman, and would serve notice that U.S. foreign policy is no longer content to let matters of this magnitude simply sit in limbo along with stalled attempts at real peace. Aaron Eitan Meyer is an author and attorney. He is affiliated with and is a former assistant director of The Legal Project at the Middle East Forum, a nonprofit think-tank that promotes American interests in the Middle East.